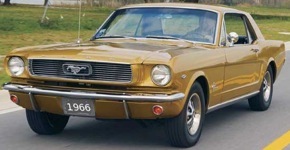 In 1966, rumors are that 50 special ordered Anniversary Gold Mustangs were built as part of the Millionth Mustang Anniversary, special order number 1111 and sent to dealerships across the nation. Of the few that have been found, the common features include that they are all hardtops and have C-code 289ci 2-barrel V8 engine, pony interior, steel styled wheels, and special Anniversary Gold paint. Super rare 1,000,000th Anniversary Edition 1966 Mustang hardtop owned by Paul Axiaq from Millbrae, California. It still has it's original 289ci V8 engine. Paul tells us more, "You've heard about the 1966 Gold Edition Millionth Anniversary Mustangs that were built to commemorate the one-millionth-sales success in 1966. Well they only made about 50 of them so maybe not. They made about 50 of these and there are only 5 known to exist today! Anniversary Gold 1966 Mustang Millionth Anniversary Edition hardtop owned by Shelley McCartney Adams from Tulsa, Oklahoma. It has the black Pony interior. Shelley tells us, "My Grandpa and Grandma, Joe & Mary Jane McCartney, bought this car from an Okla City, Okla dealer off the show room floor. They owned McCartney Auto Service in Tulsa, OK. It was gave to me in a will, because I kept my first car that I still have - a 1967 Stang." Anniversary Gold 1966 Millionth Anniversary Mustang hardtop with special order paint, full wheel covers, parchment pony interior, and a 289ci V8 under the hood. 50 of these were built as part of the Millionth Mustang Anniversary, special order number 1111 and sent to dealerships across the nation. Of the few that have been found, the common features include that they are all hardtops and have C-code 289ci 2-barrel V8 engine, pony interior, steel styled wheels, and special Anniversary Gold paint.